Jon Stewart stepping down from The Daily Show: He was bad for liberals. He was hilarious, but I am glad to see him go. Jon Stewart tapes The Daily Show at the University of Denver on Aug. 26, 2008. Seventeen years ago, The Daily Show was a forgettable late-night lark on a little-watched cable channel. Today, after covering seven elections and countless scandals, controversies, and local quirks, the show Jon Stewart built is an institution of American television and an incubator of comedic talent. In addition to making Stewart an international icon, the show has helped launch careers for a roster of former writers and correspondents, including Steve Carell (now up for an Academy Award for Foxcatcher), Stephen Colbert (soon-to-be host of the Late Show), John Oliver (now on HBO), and Larry Wilmore (who has his own Comedy Central show). 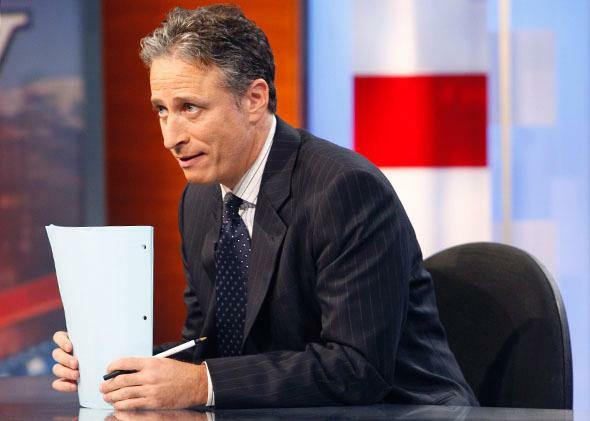 All things must end, however, and on Tuesday, Stewart announced his retirement from The Daily Show. To the gaggle of American liberals who watch Stewart and thrive on his comedy, this is a terrible blow, since for them he’s a sparkling island of sanity in a polluted ocean of inane shouting and dishonest personalities. I grew up with The Daily Show. It hit its stride during the 2004 election—my last full year in high school—and was critical viewing when Barack Obama won the Democratic nomination and then the presidency, my last full year in college. I attended Stewart’s Rally to Restore Sanity and/or Fear in 2010 and have watched the show on a semi-regular basis for almost a decade. And as a liberal, college-educated millennial—the almost prototypical viewer for The Daily Show—I’m thrilled Stewart is leaving. I’m not saying this because Stewart has given his time or deserves to try something new. I’m saying this because Jon Stewart, with his brand of left-leaning cynicism (sprinkled with occasional earnestness), is a bad example for the liberals who watch and love him. The emblematic Stewart posture isn’t a joke or a witticism, it’s a sneer—or if we’re feeling kind, a gentle barb—coupled with a protest: I’m just a comedian. Sometimes, this is refreshing. Of everything Stewart can be proud of in his professional career, special attention goes to his appearance on an Oct. 15, 2004, episode of CNN’s Crossfire, then-hosted by Paul Begala and Tucker Carlson. In his now famous rant, Stewart goes after the two hosts—and cable news writ large—as bad for the country. “Stop, stop, stop, stop hurting America. … Right now, you’re helping the politicians and the corporations. And we’re left out there to mow our lawns,” he said. More often however, Stewart’s stance is frustrating. His protests to the contrary, Stewart is a pundit, and like many pundits, he’s wed to a kind of anti-politics, where genuine difference doesn’t exist (or isn’t as relevant as we think) and political problem-solving is mostly a matter of will, knowledge, and technocratic know-how. Take his Crossfire appearance. Lurking in his media criticism was a larger idea about the pointlessness of ideological combat. “To do a debate would be great,” he said, responding to protests from the hosts. “But that’s like saying pro wrestling is a show about athletic competition.” In the context of Begala and Carlson, this was a fair point. But in the larger world, it’s off. No, you’re not going to find sophisticated arguments on cable news, and to the extent that places like CNN are vehicles for nonsense and quasi-dadaist performance art, Stewart is right to mock and ridicule. Cable, however, isn’t the only forum for debate, and most political conversations aren’t as shallow as the ones you see on TV. On op-ed pages and around dinner tables, Americans have substantive conversations about politics. And while the facts aren’t always right, the discussion is often valuable. Stewart gives short shrift to that kind of talk. Instead, in the world of The Daily Show, the only politics is cable politics, where venality rules, serious disputes are obscured, and cynicism is the only response that works. Not only does this discourage people who want to make a difference—like the earnest young viewers of Stewart’s audience—but it blurs the picture and makes it hard to see when those arguments really matter. It’s how we get the spectacle of Stewart’s rally, when tens of thousands of liberals gathered on the National Mall in Washington to hear an ode to civility—with an extended metaphor about the Lincoln Tunnel—as if Washington gridlock were a case of bad manners and not deep-seated ideological differences about government and its place in the world. Again, there are times when this basic perspective is vital, when we need someone to bathe our government in light and mockery and challenge the dishonesty, incompetence, and self-seriousness of our leaders and elites. But this approach, which worked wonders during the Bush administration, isn’t always the best one. For liberals in particular, the idea that government is only hypocrisy and dysfunction is self-defeating and nihilistic. The natural response to all of this is a version of Stewart’s protest—He’s just a comedian—and a refrain from The Dark Knight: Why so serious? The answer is easy: He’s influential. And for a generation of young liberals, his chief influence has been to make outrage, cynicism, and condescension the language of the left. As a comedian and talk show host, Jon Stewart has been pretty funny. But as a pundit and player in our politics, he’s been a problem. And while I wish him luck in his next move, I’m glad he’s stepping from the stage.